U can just walk up to this Sweet shop for buying good sweets or for eating dessert post ur meaty & fishy snack / Dinner at Chatori Gali Bhopal. They have a huge variety of Chhena (cottage cheese) based sweets in addition to the usual Kheer / Khoya based sweets & daal based ones. We walked up to the shop & said ‘We want to eat some sweets. Pls give us 3 sweets that u r proud of’. First we were served some very good rasmalai – super soft , fairly thick , perfect sweetness. Next to this we were served something like a milk cake. That had no twist to it but was a good traditional milk cake. 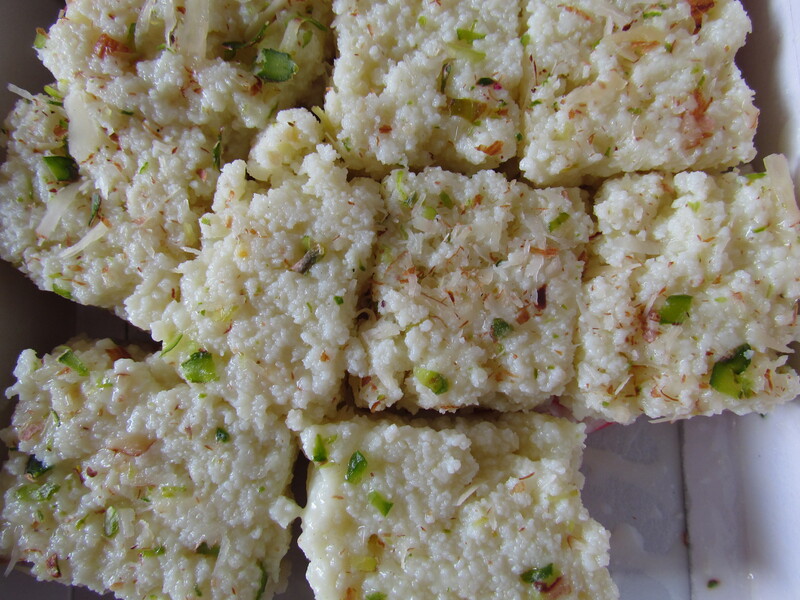 Third we were seved a Kalakand – Raseela, thick granular & slightly extra sweet & enjoyable. Will try out other options in my next visit to Chatori Gali & keep informing u.